Featured on Pepperberry & Co and Give Away!!! I'm so happy to let you know that today I'm featured in a wonderful blog called Pepperberry & Co.
Sandra's blog is full of very interesting post and also great tutorials and every Tuesday she features an Etsy Seller that inspires her in a series called Tuesday Tales! Today...she chose me and my shop! Please, take a look at the interview and also...partecipate into the give away! This is my first one and I'm offering one of my 4in1 cases of your choice. The one you can see here below it's just an example but feel free to browse my shop and let me know which one is your favourite. For partecipate in this give away, you must be a follower of this blog, then go to Pepperberry & Co. blog, post a comment there about your favourite 4in1 and became a follower of the Pepperberry & Co. blog too! And please, don't forget to visit Sandra's shop too, you'll find lots of wonderful items there!!! I won the crocs giveaway!!!!!! 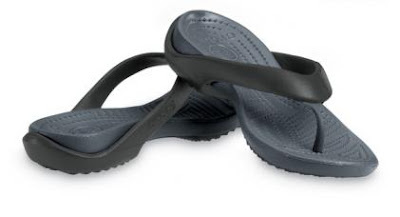 And...Oh my...I'm the lucky winner of a beautiful pair of crocs!!!! I chose those you can see in the pic and I can't wait to receive them!!!! Thanks so much Nathalie, you were so generous to have such a great giveaway!!!!! If you would like to visit Dina Fragola Etsy shop, here it is! Summer is definitely ending and so...this is my warm welcome to the Fall/Autumn season! 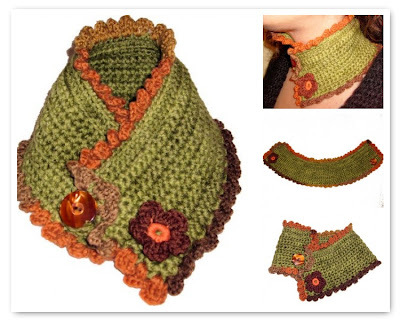 This is a beautiful and unique crocheted collar or neckwarmer! I made it with an italian yarn that is 100% Merino Wool.The vibrants colors have all the shades of the autumn leaves, from green to brown and orange!The collar or neckwarmer is 17" long and x 4" wide. It's closed with a button and I've crocheted a button hole.I've added a crocheted little flower that surely adds a very nice touch! Patrick Swayze: Goodbye and Thank you!!! Who can forget this beautiful guy? Who can forget "Johnny" in Dirty Dancing? Who can forget him in Ghost? I fell in love for you immediately like millions of other teen agers all around the world! So...be sure...we'll never forget you Patrick and I would like to thank you for all the magical moments you gave us trough all your movies!!!!! The most famous squirrel of the world!!!! This is actually the most famous squirrel of the world!!! This fun pic is everywhere on the web and this little squirrel is just too much cute!!!!! Ok...they used the "auto" click of the camera, chose a nice place that shows the beautiful scenery around them...3...2...1...smile and...OPSSS!!! 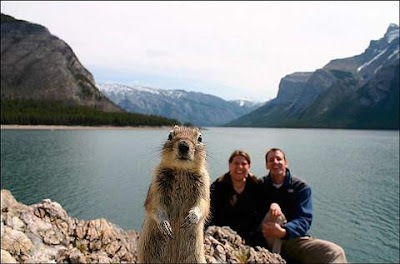 The squirrel was there while the camera take the pic!!!!!!!!!!!!! This is sooooo much fun!!!!! Those cute "foods" looks soooo yummy and...they have ZERO calories!!! So...it seems that they perfect for me!!!! LOL!!!! Today I found on Etsy for you this beautiful shop: BEAG. I love colorful and creative items and this shop is just full of them!!! 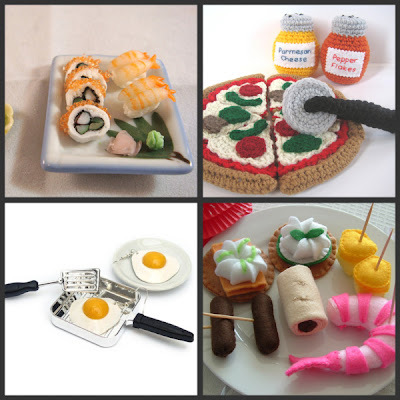 Great items, beautiful and so colorful yarns and also great pics!!! 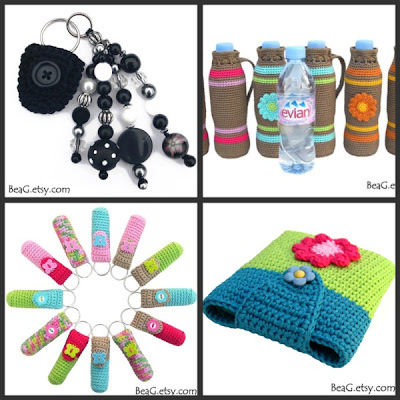 All the items are hand crocheted by the very talented owner of this shop: lip balms holders, key chains, jewelry, tutorials...surely you'll find something nice for you and also for make nice gifts!!!! I've got a new tool!!!!! 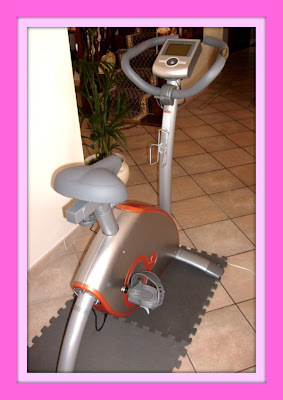 This is my new tool: a cyclette!!!! I can also try to wear my pink sunglasses when I'll use it but...not sure those works too...LOL!!! It seems that I also love to stay sit down...for reading, for sewing...for playing with my computer...and...it's TRUE!!!! Not an easy thing for sure!!!! LOL!!!!!! Does someone have some suggestions???? Thanks and have a nice day!!!!! Do you love pretty scarves? And...when I found Pretty Panda shop on Etsy...I really MUST to buy one! 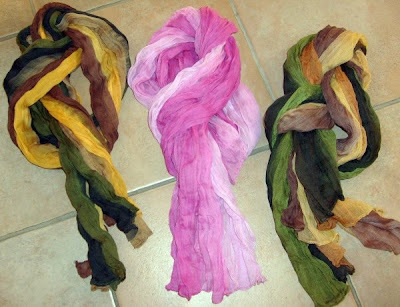 So...I bought for myself the pink one, I love pink and this scarf is beautiful!!! Then, my Mom saw it and would like a scarf for herself too and so...I bought another one for me...and one for her...LOL!!! Unjung, the owner of this lovely shop is really a lovely and kind lady and her scarves are awesome, really well made and the colors are gorgeous!!!! 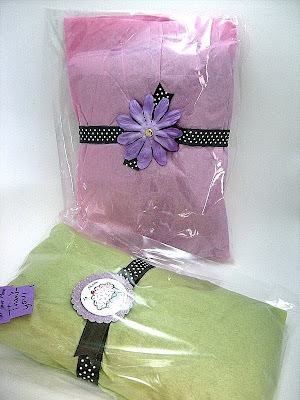 They come really beautiful packaged too as you can see in the pic and...she also includes some really nice gifts!!!! So...definitely...it was really a happy purchase!!!! Please, visit her shop, she also has some cute jewelry!!!! Every week the Europeanstreetteam host a challenge between all the members!This week the host is Blue Terracotta that won last week challenge. She chose the theme "The enchanted Forest" and this is my entry! For to see all the other entries, please, go here. I called it "In the middle of the forest" and you can find it in my shop! 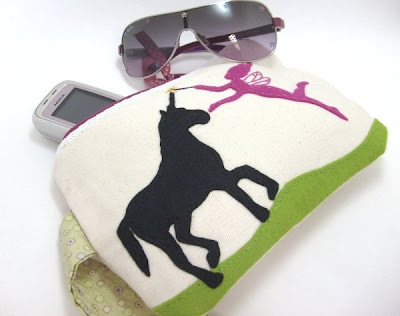 It's a very cute canvas wristlet. It has has a felt black unicorn and a cute little felt pink fairy appliquè on it. I've also added a nice lace on the top of the wristlet! 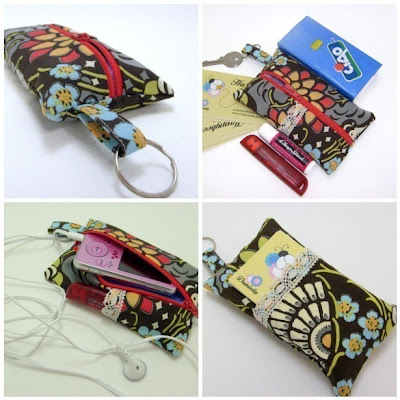 It's completely lined with a 100% cotton fabric, interfaced with a light medium interface for give it body and shape and well padded with a medium weight batting so it's perfect not only for your keys, lip balm, driver licence and all the little things you have in your big bag but also for your cell phone or ipod or camera! It's closed with a matching zipper! This is the perfect accessory for any romantic and "girly" girl and make a great gift! It's about 8" long and 6" tall and the wrist strap is 7". It has a really nice shape, not the classic squared or rectangular wristlet! Now...we are ready for the awesome colors of the Fall season and Stylish Stems' shop is full of wonderful fall items!!!! 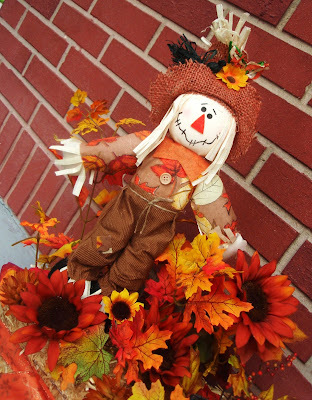 I found this Scarecrow in a hay bale arrangement, it's beautiful and surely looks great in any front door!!!! Please, check this shop for more Fall items!!!! Provence is really amazing, full of wonderful colors everywhere! But...the thing that was most eye catching for me were...the windows!!! 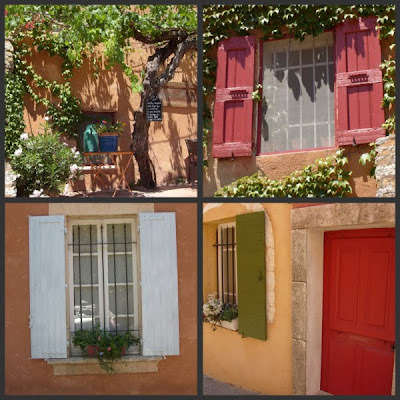 Well...the windows in Provence (mostly there but also in other French regions) are really gorgeous!!! So colorful and with beautiful flowers displaied on them! And the fun part is that all the turists are so interested in the windows and I bet that no one come home from France withouth a beautiful pic of at least 1 window!!! LOL!!! Some times, in front of a nice window...I had to wait because there were lots of other turists that are taking pics...LOL!!! Now...my question is:what the French people think about us turists that can wait also 10-15 minutes for take a pic of a theyr window???? LOL!!!! If there is some French that is reading this post...I'd really love to read a comment...LOL!!!! Scented candles, soaps, beauty produtcs and also jewerly! Prices are also so affordables so...please, what are you waiting for? 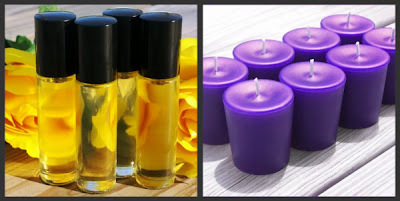 Scented luxuries is waiting for you!!! 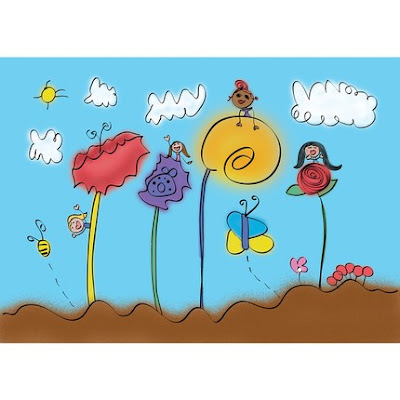 Let's your kids' imaginations flies and...create a piece of art from theyr draws!!!! This is the Garden Fairies, and you can find it in Rasperrikidz' shop.